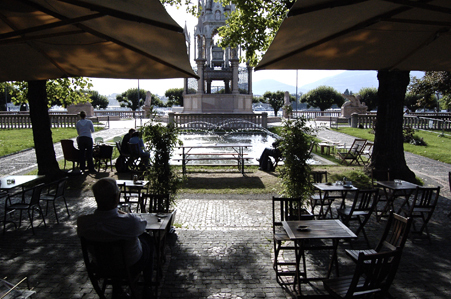 I have been thinking about my favourite cafés in Geneva for a while, compiling an imaginary list in my head of the sort of place where you snuggle up to a steamy cup of leaf tea or coffee and forget all your worries for a while, or where you seek solace from a baking hot day before picking up the kids. The Cottage Café is definitely one of these: tucked away in a small green behind the Brunswick monument and fountain, it’s home to one of the coolest (in every sense of the word!) 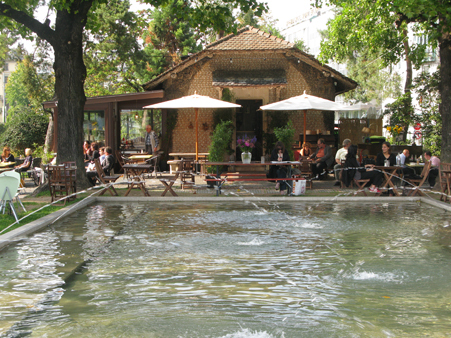 terraces in this city of peace. Who would have thought you could find such lush, bucolic respite right in the midst of peak hour traffic ? 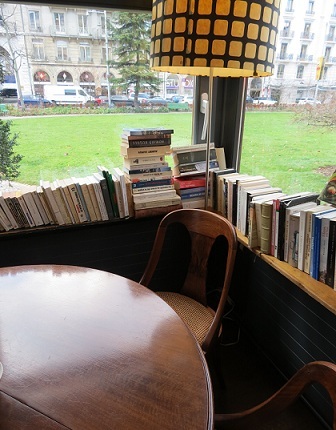 A Geneva institution since its opening in 2008, this café is the epitome of quaint coziness with its eclectic decorating style, great vintage pieces and countless books just begging to be leafed through. 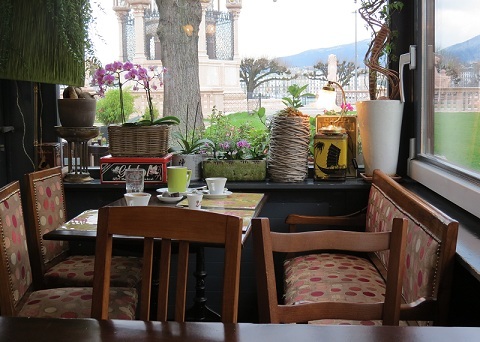 From breakfast to afternoon tea and evening tapas, the Cottage Café is a safe haven for locals and tourists alike thanks to its beautiful shaded terrace overlooking the neo-gothic tomb of the Duke of Brunswick and, at a distance, Geneva’s jet d’eau. Oh, and did we mention their salads & homemade cakes are just heavenly? Did you know ? The opulent neo-gothic construction built in 1879 out of pink marble is the final resting place of the eccentric Charles Frederic Auguste Guillaume, Duke of Brunswick. A fabulously rich philanderer, he was involved in numerous political intrigues across Europe before finding shelter in Geneva. When he died, he left his huge fortune (22 million gold francs, about 22 billion francs today) to the City of Geneva upon condition that they erected a magnificent monument in his memory, in a “preeminent and dignified location”. And, as you can see today, that’s exactly what they did. Amazing post! 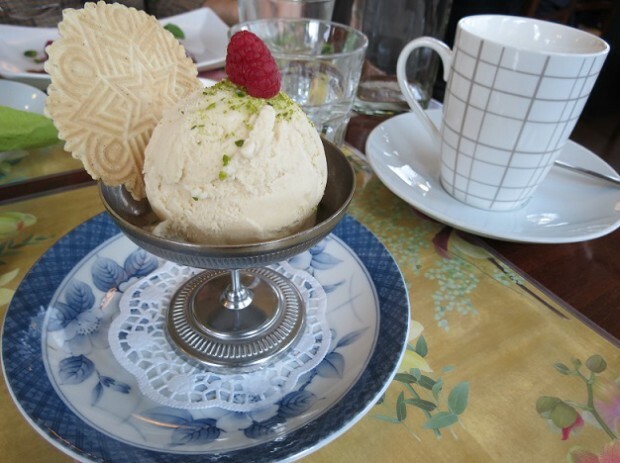 Thanks for sharing beautiful images of summer ice-cream and cottage cafe. Its really interesting to read. I just discovered your blog and I love it… Being myself an expat from Geneva in Los Angeles, it makes me all nostalgic! 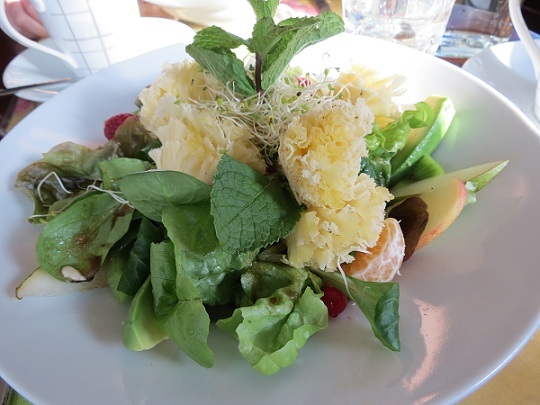 I used to live in the Square du Mont-Blanc and I would go to the Cottage Café for business meeting, the place is so lovely, I just wish the food would be better!